One bit of this gooey, creamy hot cream cheese dip and you are going to keep on dipping. This cream cheese dip recipe is quick and easy and is perfect for any time. Gameday, a party, or just because. Not only is this one of the most popular hot cheese dips I make, but this appetizer is ready in just minutes! If you love appetizers as much as we do, don’t forget to check out my Best Gluten Free Appetizer Recipes! With school in full swing, I am always thinking about how to get my kids to eat more protein so that they have some energy for after-school activities and homework. I know I have spent a lot of time talking about Lance Gluten Free Crackers. I can’t help it. Their crackers are so easy to enjoy by themselves and in my favorite recipes. Today I want to talk more about Lance Gluten Free Cheddar Cheese Crackers. 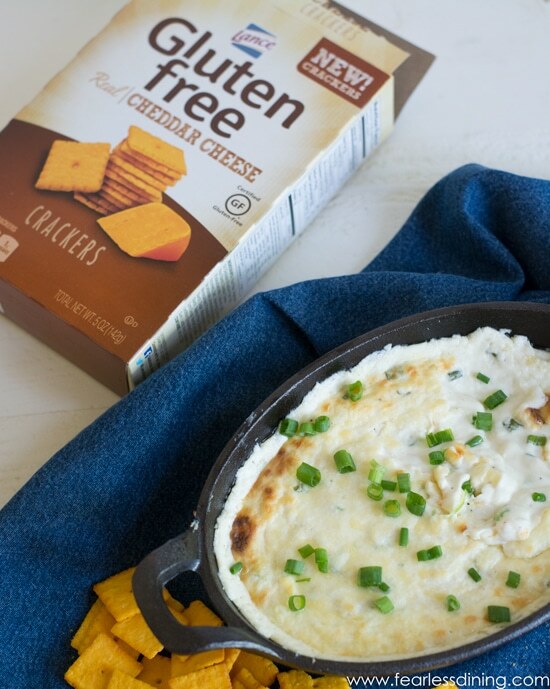 Lance’s Gluten Free Crackers are AHMAZING dipped into this gooey hot cheese dip!! These cheese crackers are perfect to use in recipes like this delicious quiche recipe, they are great alone packed in my kids’ school lunches, and they make a fun cracker for dips! Before we knew we had to be gluten-free, I fed my kids Cheez It crackers. Once we eliminated gluten from our diets, we missed cheese crackers. It is hard when your kids are young and you take away their favorite foods. There wasn’t a substitute and I wasn’t savvy enough to create a gluten-free cheese cracker for them. I have to say, we are pretty thankful to have found Lance Gluten Free Crackers. Are you ready to give this recipe a try? I think you will love this cheese dip because it is so versatile You can use your favorite flavors in this hot dip. 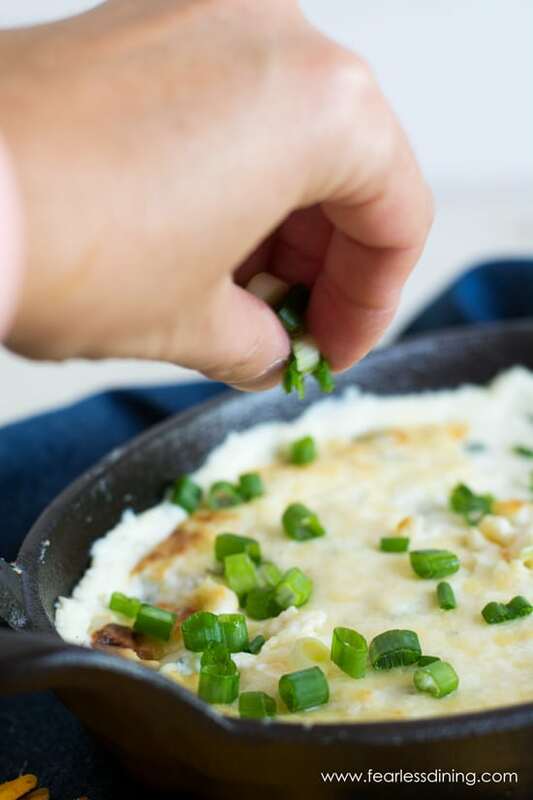 We love scallion, so we used chopped scallions in our recipe. Thawed frozen spinach that has had the extra water squeezed out. Sundried tomatoes or fire roasted red peppers. Fire roasted hatch chiles! This would add a lot of delicious spice to this cheese dip. I made a double batch of this dip because I knew my kids would love to snack on it after school. I used a high protein Greek cream cheese so I knew this would give them an energy boost to get started on their homework. When Should I Serve This Cream Cheese Dip? Dinner Party – Serve it as an appetizer and everyone will be begging for the recipe. Showers – This hot dip will go over well with a crowd, so a baby or bridal shower is the perfect event to serve it at. Potlucks – Take this to the next potluck, and I am confident you won’t have any leftovers to bring home. The first step is to let the cream cheese soften on the counter. I took mine out before I took the kids to school. By the time everyone was dropped off, it was the perfect temperature for the mixer. Spread out the cheese, then spread parmesan on top. Bake for 15 minutes and serve hot. Can I Freeze Leftover Cream Cheese Dip? Yes, you can freeze leftover cream cheese dip. I will warn you that the texture may be slightly different than when you make it fresh. It will still taste fabulous, and you can make a double batch to freeze for later. To freeze the dip, place it in an airtight glass container, plastic bowl with lid or freezer bag. The best way to defrost the dip is the place it in the fridge the night before then you can rewarm it in the oven. How Can You Tell If Cream Cheese Dip Is Bad? Cream cheese dip has gone bad if it has developed any kind of mold or discoloration. If it has become dried out or is slimy, then that is another indication that it is old. Cream cheese should never feel chalky or grainy either. If the dip no longer smells good and you notice a sour odor, then toss it out. Typically, the leftover refrigerated dip will last 5-6 days. Can You Reheat Hot Cream Cheese Dip? Yes, you can totally reheat hot cream cheese dip. My favorite way is to warm it up in the oven at 350 degrees for 12-15 minutes until it is heated all the way. The microwave is another option if you are in a hurry. If you decide to use the microwave heat it in 20-30 second intervals. It will heat really fast, so you want to stir it, so the edges don’t overcook. 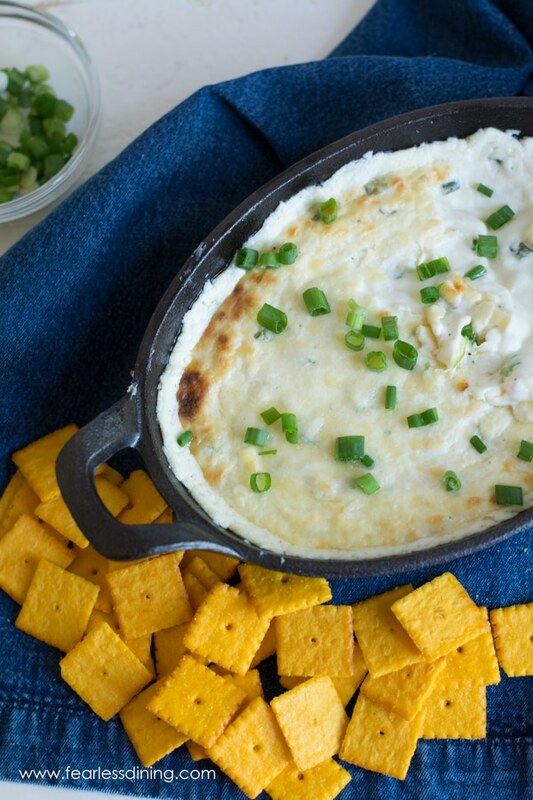 Can I Make This Cream Cheese Dip With Scallions In A Slow Cooker? Yes, you can make this quick and easy hot cream cheese dip in the slow cooker. I actually love to do this as the flavors blend beautifully!! Place all the ingredients in the slow cooker, stir them up and heat them on low for 2-3 hours. If you want to add any extra ingredients like bacon, put them in at the same time as the other ingredients. Once the dip is gooey, bubbly and hot, it is done. **It’s important not to overcook the hot cream cheese dip because it will begin to separate after a while and the texture will be off. Vegetables – Dip veggies like carrots and celery or top cooked asparagus with it! Bread – Take pieces of gluten free bread and dip! I promise every bite is going to be delicious. Try my Gluten Free Focaccia Bread recipe! Pretzels – Use your favorite gluten free pretzels, and there won’t be a drop of dip leftover! French Fries – All I can say is holy yumminess! You will want to indulge in this every once in a while. Tortilla chips – Everything tastes great with crunchy tortilla chips. 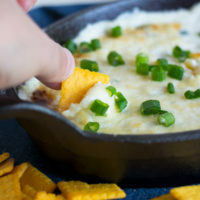 A cheesy hot cream cheese dip with scallions. 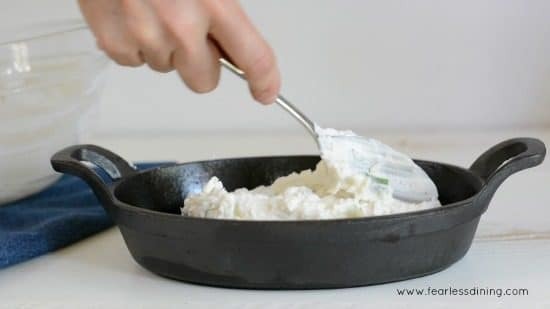 Add softened cream cheese to a large bowl and mix with an electric mixer. Add garlic, gouda, scallions, and seasoning. Mix in with the electric mixer. Pour the cheese mixture into a baking dish and bake for 20 minutes. Such an excellent recipe, Sandi! I will definitely give it a try as soon as possible. This is a great idea for a movie night, right? Two words: cheesy goodness!! Love it!!! I’m going to need to try this asap! It has my mouthwatering! I’ve never had hot cream cheese before, I may have to try this one out. Wow that dip looks amazing! And I’ll have to try those gluten free crackers. Thanks for sharing! 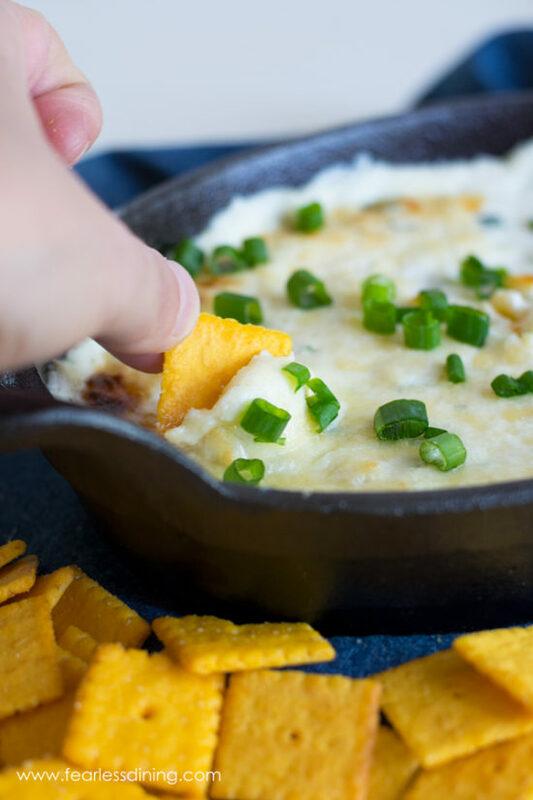 This cheese dip looks like a crowdpleaser! I want to put this on my list for the next football party! Thank you for such a yummy recipe that’s easy! oh my goodness does this sound delicious! i will have to give it a try! Well doesn’t this look yummy, it had been added to my must make list for this weekend! This looks so yummy! Love that you added a few suggestions for other ingredients! Definitely trying this! Oh my goshhhh this looks so amazing!! I’m definitely going to save this recipe to try — my husband is going to love it!! Wait! Cheese crackers with cheese dip! That sounds like I died and went to heaven! Looks so delicious and easy to make! Perfect for football season! Holy cow, this looks delicious! Thanks for sharing! I am definitely going to try it! I seriously need these crackers in my life! Hot cream cheese dip?!?! Yes, please! I love how easy this recipe is to follow and will definitely try it soon. Well, I know what I’m making with dinner tonight! And probably for the rest of the week 😉 Thanks so much for sharing the recipe! LOL, enjoy Taylor :-). I could live on melty cheese too! Ooh this looks so tasty and healthy! love the added protein of the Greek cream cheese – I’ll have to keep an eye out for that! 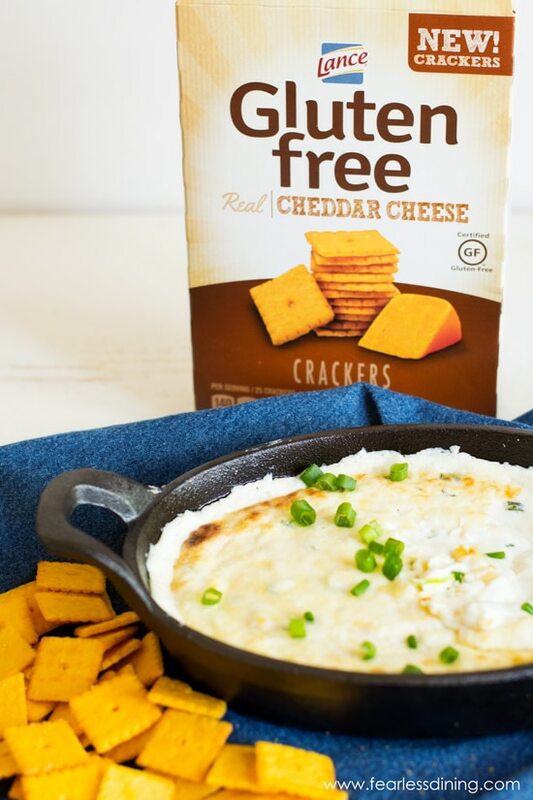 And who wouldn’t love some gluten free crackers to go with? Thank you Melissa, I hope you can find the Greek cream cheese. If not, regular cream cheese works too :-). This sure is an easy cream cheese dip! I’ve never looked for Greek cream cheese, but i will have to keep my eyes open for it. I love the idea of mixing this up with different cheeses or stir-ins too. Seems like a great recipe to keep in your back-pocket for entertaining. I’m addicted to cheese dip! I could probably eat the whole thing on my own. I never tried cheese dip with scallions. I will try it out. Out of nowhere I was craving cream cheese this morning! Must have felt your post from afar, LOL! 😉 Looks really delicious! A perfect dip to accompany crackers…sounds and looks so good! Ooooh, I’ve never had Greek cream cheese, now I’m on a mission to find some, this looks amazing! Oooh dang this looks delicious! I love pretty much anything with cream cheese in it, and I might have to make this dip!